In her most intricately plotted novel yet, Kerry Lonsdale delivers a compelling story of love, lies, secrets, and betrayal that’ll keep you turning the pages until it’s shocking ending. Last Summer will take you on a journey from the snow-capped Sierra Nevada to the frozen slopes of southeast Alaska and leave you wondering: How far will you go to get what you want? This giveaway is now closed. Thanks to all who entered. Winners will be contacted via email on Friday, April 12, 2019. Eligibility: Giveaway participation open to legal residents of U.S. only. Period: Giveaway starts April 5, 2019 and runs through April 11, 2019. Winners: Five (5) Eligible winners will be selected through a random drawing and notified via email on April 12, 2019. A list of the winners can be requested by contacting Kerry Lonsdale here. 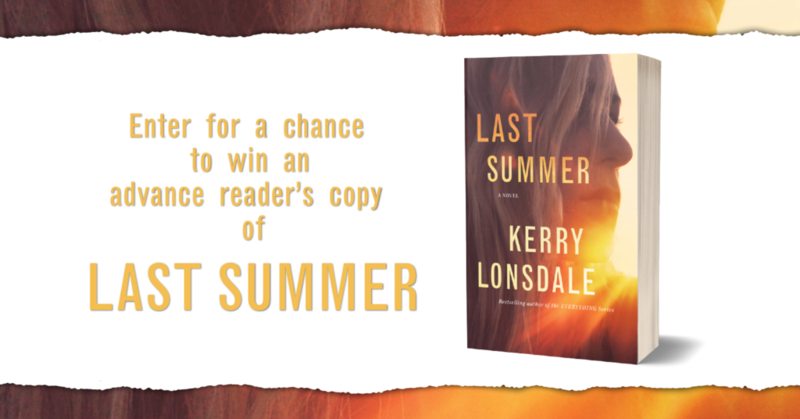 Prize(s): Five (5) signed advance reader’s copies of Kerry Lonsdale’s Last Summer, one copy to each winner. (apv $5.00) Prize non-transferrable. No cash redemption. Notification: Winners will be notified via email on April 12, 2019. Winners agree to provide mailing address to ship advance reader’s copy. Other conditions/terms: Entrant agrees to be signed up for Kerry Lonsdale’s newsletter. This giveaway is in no way sponsored or endorsed by Facebook or associated with Facebook. You are providing your information solely to the sponsor. By entering the giveaway, entrant agrees to abide by these rules.